Olivia Bina is a Principal Researcher and Deputy Director at the Institute of Social Sciences (University of Lisbon) and Adjunct Assistant Professor at the Department of Geography and Resource Management (Chinese University of Hong Kong). Her research critically examines the changing notion of sustainability and the need to define the key elements of sustainable futures, especially in the expanding urban contexts. Olivia Bina has a longstanding interest in understanding our changing relationship with Nature, and how that is at the origin of the many challenges facing the 21st century. She sees herself as an interdisciplinary ‘policy-engaged’ researcher, trying to wrestle with challenges of the (un)sustainability of our socio-economic model and its effect on our quality of life, through the lens of environmental governance, sustainable development and transitions theories. The general idea is to assist in efforts towards progress beyond growth. Olivia Bina's work combines sustainability and socio-economic transitions theory with environmental governance. She has researched and published widely in the field of environmental governance, contributing ideas to its theory and mechanisms (assessment, policy processes; knowledge and policy learning), in different contexts (Europe, Latin America and China). Having studied and experienced the limits of ‘better governance’ to pursue more sustainable futures, Dr Bina is now exploring notions of progress and sustainability by questioning the paradigm of growth, including the (re)turning ideas of “greening” growth in economics and international development discourses. She also questions the propositions for “green/eco/low-carbon” at the urban scale and is interested in foresight as governance mechanism, both in relation to socio-economic questions, and in terms of urban futures. 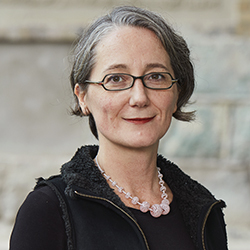 Olivia Bina's longstanding commitment to the effective use of interdisciplinarity in research has led her to Chair the COST Action: INTREPID – “Interdisciplinarity in research programming and funding: the case of urban development”. She holds a degree in Political Sciences (Italy), a Masters in Environment and Development and a PhD in Geography from the University of Cambridge (England).